This recipe reminds us of spring with a beautiful green sauce, and comes from the beautiful region of Navarra in northern Spain. This is a simple recipe, that is full of taste. Parsley is the main ingredient of the sauce, and the source of the green color. Like all traditional sauce, there are many variations. Some green sauces contain green peas, asparagus, or green peppers. Peel and finely chop the onion. Rinse the peppers and remove the stems, seeds and veins. Finely chop parsley leaves. Peel the garlic cloves. Rinse and pat dry the salmon steaks with paper towels. Place in a glass baking dish. Pour lemon juice on top, and sprinkle with salt. Allow to marinate in the juice for about 10 minutes. While the salmon is marinating, prepare the sauce. Pour 2-3 tablespoons olive oil into a medium-size frying pan and heat on medium-low heat. Sauté the chopped peppers and onions until soft. Add the white wine and fish stock. Reduce the heat to low, and add parsley. Using a stick blender in the pan, blend the vegetables and liquid into a smooth sauce. Remove pan from heat. Cook the salmon. In a medium frying pan, heat 2-3 tablespoons olive oil on medium. Brown the peeled garlic cloves in the oil, then remove. Cook the salmon on both sides in the garlic-infused oil. 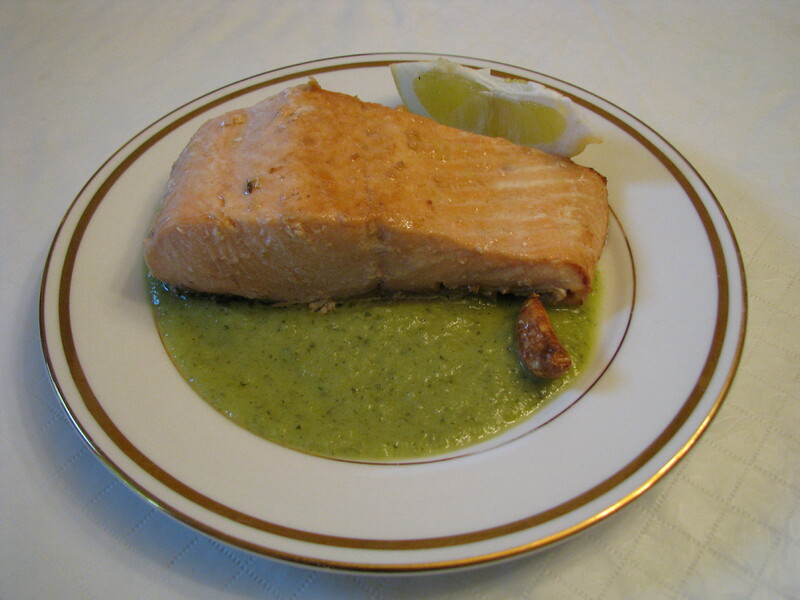 Spoon green sauce onto plates and place salmon steak on top. Garnish with a lemon wedge, garlic clove, and parsley sprig. Serving suggestion: Serve with white rice or country-fried potatoes.